Movie reviewers rate movies on a scale of 0 to 10. Each movie comes with a set of reviews that can be changed by the user. The mean of a data set can be explored using a see-saw balance model. Students can also find the median, mode, and range of the data set. Calculate the mean of a set of data. Understand and interpret mean as a balanced center of data. Calculate the median of a set of data. Identify outliers and understand their effect on mean and median. Students will find mean, median, mode, and range for a movie of their selection. This worksheet asks students to take snapshots of the mean, median and mode of the reviews of a movie and... (more) then write explanations of how each measure was determined. Students then decide which measure they would choose to represent the data and justify their choice. Worksheet modified to eliminate summary score. Great visual representation for central tendencies! This is a great visual gizmo for teaching measures of central tendency. Middle schoolers love the format! 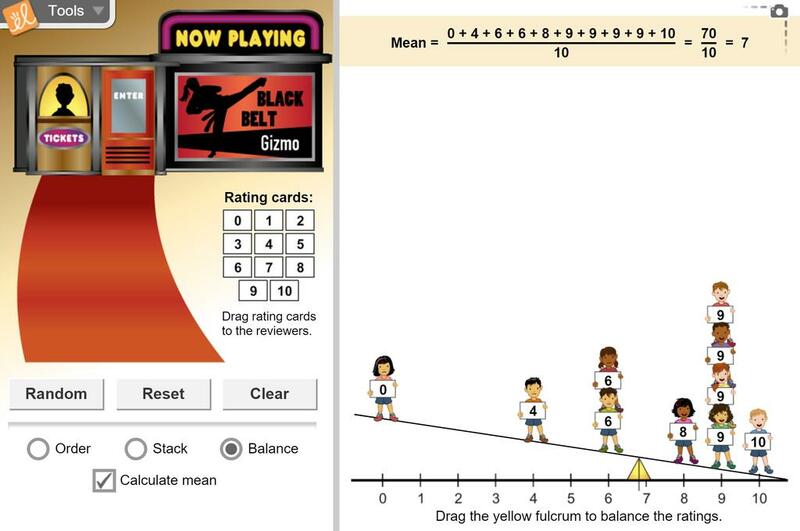 This Gizmo is a great visual representation of the abstract concepts of mean, median, and mode!